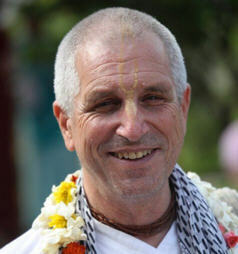 Dina Bandhu Prabhu is settled in braja. Although from a foreign country, he looks exaclty like one of the local brijawasis. He speaks the local braja language & nicely interacts with the locals. He loves to take devotees on parikrama in Vrindavan. He is part of ISKCON braja parikrama every year. He is an excellent narrator of Krishna's pastimes. He is the source of inspiration for renovating of Vrinda devi temple near Nanadagaon.